So much has changed from a cultural standpoint over the past decade, but nothing so unfortunate as the attempted legitimacy of lawlessness that pervades our current American landscape. It seems like only yesterday when encouraging a foreign invasion on our southern border was considered a radical and dangerous sentiment. Now, it’s practically the spoken word throughout the mainstream media, Democrat political offices and Hollywood social media accounts. Of course, we now live in a country where the American flag is considered a “hate symbol” on certain college campuses, so I suppose nothing should shock us anymore. Had former presidential hopeful Barack Obama campaigned on the idea of opening our southern border to anyone who wished to cross it, without any verification whatsoever of who they are, what crimes they’ve committed or what provable and legitimate claim to asylum they may have, he would’ve been finished. Nowadays, an open border is essentially the Democrat party slogan. What happened? What happened was something that all Americans should take notice of—incremental destruction. Sounds like the typical response from our current Commander-in-Chief, right? Actually, that quote was from a different man, a then-Senator of Illinois by the name of Barack Obama. Obama was cunning enough to know that the American people would no more accept open borders with Mexico than they would open doors with their neighborhood, and so an incremental change was necessary. Incremental or not, fast-forward a decade, and opinions like those expressed explicitly by Obama would be enough to get you banned from social media and called a Nazi by the mainstream press. Disingenuous or not, former Senator Obama’s words were spot on. There’s nothing racist about locking your doors at night; millions of Americans of every race, gender, religion do it every night. In fact, it is those who are supporting this attempted invasion who are disgracing legal immigrants such as myself, who had to go to extraordinary lengths to achieve citizenship legally. Tens of thousands of dollars were invested after years of penny pinching, and countless hours were spent studying American civics and history. Lawyers, paperwork, medical testing—it’s all part of the well-worth-it process of coming to America the legal and legitimate way. 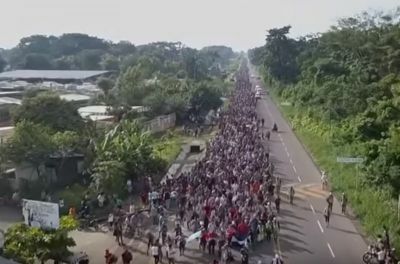 Those who took the time to follow the rule of law and went to these extraordinary lengths, making tremendous personal and financial sacrifices, are watching this caravan invasion on television and those who support it with resentment and betrayal. After thousands of caravan members stormed the border at the San Ysidro Land Port of Entry, border patrol agents were forced to respond with nonlethal tear gas, after having lethal objects thrown at them by the invaders. Rather than express support and gratitude for those who put themselves in harm’s way to protect this nation, Democrat officials chose a different route—one that would have been political suicide a decade ago. Swalwell later added that the new Democratic Congress would seek to disarm border patrol of any weapons they might use to defend themselves before deleting the tweet and rightfully crawling back into a hole of embarrassment. Miss Lee seems to think that the United Nations should be allowed to tell our border patrol agents how to defend their lives and do their jobs. I’ll also add that as a mother, any woman who would use her child as a shield, knowingly endangering their lives, is not someone who deserves to call themselves an American. By the way, we are not a nation built by immigrants, we are a nation founded by settlers and built by citizens. Immigrants become citizens, and then add to the fabric of the American ideal. Immigrants who make this country better do so assimilating to America—not the other way around—as well as by following the law, not breaking it. Brigitte Gabriel is a New York Times best-selling author, terrorism expert and founder of ACT for America. Her new book, “RISE: In Defense of Judeo-Christian Values and Freedom,” was recently released.